Delivered Cheyenne 8/10/43; Gr Island 26/10/43; Romulus 1/11/43; Assigned: 570BS/390BG [DI-S] Framlingham 11/11/43; MIA Dusseldorf 9/9/44, caught fire from explosion of 42-97871; flew two hours on one engine forced landing on continental A/Fd A-22, France; salvaged and repaired by modifying to F model by 458 St/Sqd, 14/11/44. 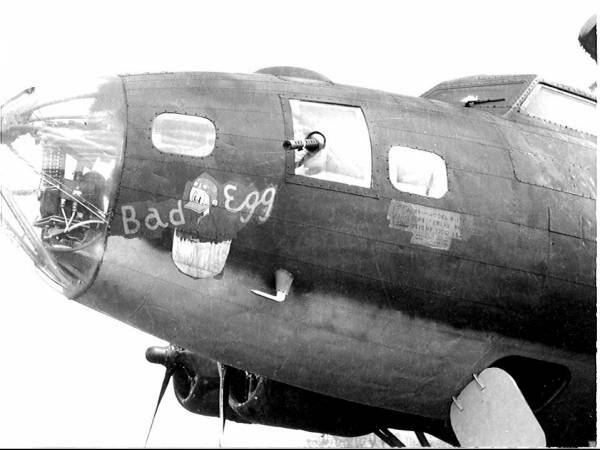 BAD EGG. Die vorderee Hälfte der B-17F #41-24484 wurde für die Reparatur und Modifikation verwendet. My Uncle Peter D. Hartnett was the pilot. I’m told he landed the crippled aircraft in Belgium, not France.